This website can be best viewed with Internet Explorer 7.0. Please download it here. 3 HP inverter motor for high torque output. C.N.C. vector-type AC frequency drive. 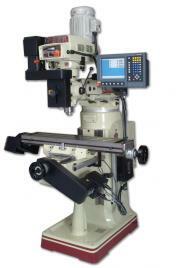 Infinite 0-4500 RPM constant spindle speed, change in no time (0-4 sec). Machine can run on single or three phase without changing the wiring. Low maintenance and down time cost because no plastic insert, key, and moving pulley. No R.P.M. changer break down, but accurate reading on R.P.M. to prolong tool life. Electronic and mechanical brake for fast spindle stop. No belt slippage for high efficient torque output. Save energy costs up to 35%.